With Super Bowl 50 almost here, PRWeek's sister title Marketing looked at the brands that have already broken cover in the advertising battle. Brands booked for Super Bowl 50 have the chance to grab people’s attention well before the game with a well-judged teaser ad or other marketing ploy. First, we look at the brands that have gone early. Meanwhile, here’s a list of brands that are definitely advertising but have kept their powder dry. On Friday, Bud Light released this 30-second ad, The Bud Light Party Is Coming, featuring comedians Amy Schumer and Seth Rogen getting ready for a mock-election rally for the Bud Light Party. The idea, playing on the upcoming presidential election, will form part of a long campaign that will kick off properly with the broadcast Super Bowl ad, according to the beer brand. The peanut butter and chocolate bar, owned by Nestlé, came out almost two months before the game with a spectacular way of announcing it would be placing an ad in CBS’ Super Bowl TV coverage. It used live video platform Periscope to show the announcement being delivered by a skydiver during a jump from 12,000 feet. The campaign idea of Bolder Than Bold has been brought to life before the game using the Paddy Power-esque approach of encouraging NFL players to break the rules on excessive touchdown celebrations by promising to pay their fines. And it has parlayed this into video content by teaming up with former NFL star Terrell Owens to challenge New Yorkers to show off their Bolder Than Bold celebrations. Doritos is a master at extending the life of its Super Bowl activity with its well-established user-generated ads competition, Crash the Super Bowl. However, it is retiring the contest after this, its 10th year. The Korean carmaker, which announced in December it would make four ads with four famous directors, released this atmospheric short video called The Chase on Monday. Living up to its reputation for economy, the car brand has so far limited its teaser activity to this tweet featuring a still from its upcoming Super Bowl ad with actor Christopher Walken. 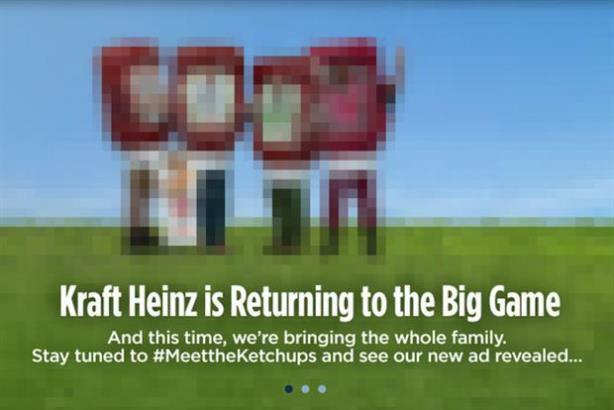 The food giant is being mysterious about its Super Bowl ad, offering just a pixellated image and this blurb. 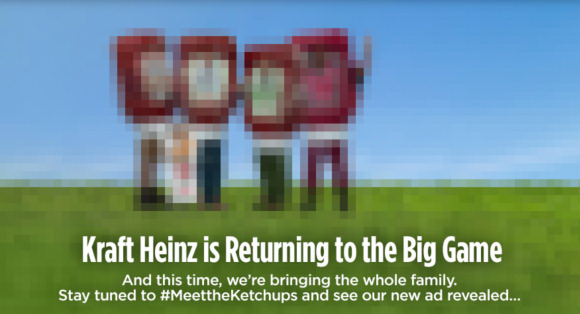 "Everyone knows and loves the great taste of Heinz Ketchup, and we wanted to introduce the world to the rest of the great tasting family in a campaign called #MeettheKetchups." If you can get Liam Neeson to appear in your ad, you want the world to know about it. It’s not clear what else this 15-second spot is telling us, but isn’t that the art of the teaser? Mini is apparently using its 30 seconds of airtime, at an average cost of $5 million, during the game to talk about how its car defies the labels put on it, such as "small." That’s a complicated idea to get across, perhaps why the brand has also produced a series of six online films featuring famous people talking how they have defied their labels and how Mini is like them. They feature tennis player Serena Williams, rapper T-Pain, former baseball pitcher Randy Johnson, skateboard Tony Hawk, former footballer Abby Wambach, and actor and producer Harvey Keitel. On Monday, the soft-drink brand released a short video showing a half-baby, half-monkey creature in a bouncer looking at its watch. The link with the Super Bowl is in the soundtrack and in the date on the end-frame. Pepsi sponsors the game’s halftime show, during which Coldplay is scheduled to perform. On January 11, Pepsi kicked off an online video series taking a look behind the scenes of the preparation for the show, called The Pepsi Halftime Show Show. The game franchise has landed a Super Bowl slot to celebrate its 20th anniversary this year, and it was the first brand to go public with its final ad. On Monday, it released an extended 60-second cut of what will be trimmed down to a 30-second TV spot. It looks like it could pay off with plenty of exposure, judging by the early plaudits and the 2.4 million views in its first 24 hours. Craft beer brand Shock Top, owned by Anheuser-Busch InBev like all the beer brands advertising in the Super Bowl, is making its debut with a 30-second ad. Its teaser comes in at three times that length and shows brand spokesman, comedian TJ Miller, talking to camera about how he is shooting "an unfiltered commercial for an unfiltered beer" that will be "the greatest Super Bowl commercial of all time." He is interrupted by an animated version of Shock Top’s "Wedgehead" brand mascot, and to be honest, the ad goes downhill from there. Seasoned Super Bowl advertiser Skittles has gone for a teaser for the GIF age, combined with a celeb from rock and roll’s past. Steven Tyler, the Aerosmith frontman, appears singing with a microphone stand made of Skittles in a two-second silent moving image published last Thursday. And that’s about all we know. The Mars-owned chocolate bar looks to be continuing its You're Not You When You're Hungry work with this teaser, published on Tuesday. It shows what seems to be Marilyn Monroe singing "Happy Birthday" to the Super Bowl in its 50th year, but she's not quite on song. 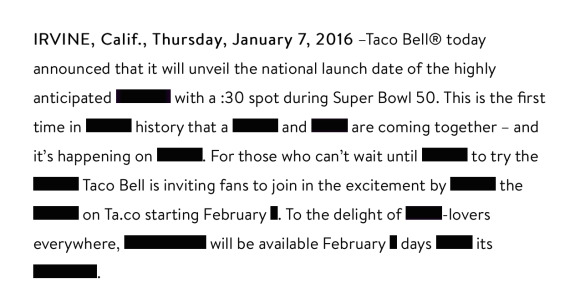 The fast food joint also came over all mysterious by publishing a redacted press release a month before the game that hints at the launch of a new product. The website hosting and design provider is wrapping its Super Bowl work inside a global marketing tie-up with the forthcoming Dreamworks film Kung Fu Panda 3. Starting January 13, characters from the film started appearing in a Wix video and social media campaign promoting its StartStunning.com website. Wix said this was one of four teaser ads it would reveal by Wednesday, and it would release its official Super Bowl ad on February 4. "Last year, 115 million viewers tuned in to watch the Super Bowl, but our campaign enabled us to engage with an additional audience of 300 million people worldwide," said Omer Shai, CMO at Wix.com. "Our goal for this year is to recreate that reach and hopefully surpass it."